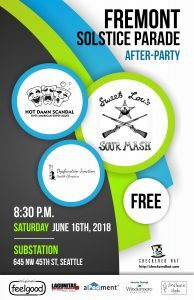 On Saturday, June 16th, Substation will be hosting a free Fremont Solstice Parade After-Party featuring three of the Pacific Northwest’s finest bluegrass and acoustic bands. Substation is Seattle’s premiere underground music venue, located at 645 NW 45th Street. Sweet Lou’s Sour Mash started in March of 2013, and has been refining their sound and high-energy live show ever since. Mixing originals, punk covers, rock ‘n roll covers, and their own twist on traditional bluegrass tunes, Sweet Lou’s is a band for all occasions. You can usually find one or more of their members at one of Seattle’s numerous bluegrass jams. They will be joined by Hot Damn Scandal, a band which finds its songs under park benches and in forgotten alleyways. The resulting outlaw ballads, dirty jazz, circus freakouts, shanty-rags, string band funk, lonesome heart-breakers, and whiskey bottle love songs blend together in a sweet song syrup somewhere between a ramble and a roar. Sometimes called ‘Northwest Devil Swing’, Hot Damn Scandal pulls no punches and and puts thunder in your molasses. This event is proudly sponsored by Original Feel Good, Lagunitas Brewing, Birdhouse Studio, Michelle Shafagh – Windermere Real Estate, and Calhoun Properties Apodment Suites. Don’t miss out on this opportunity to see these three great acts free of charge.